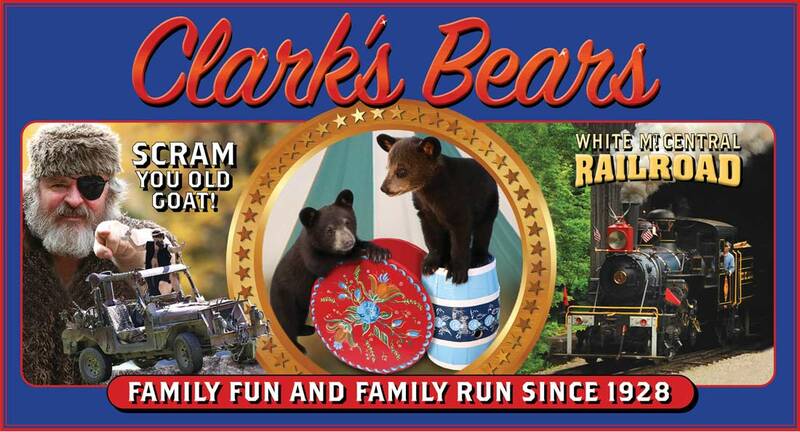 The Clark family would like to celebrate our 90th anniversary with employees past and present, by holding a special event just for them! 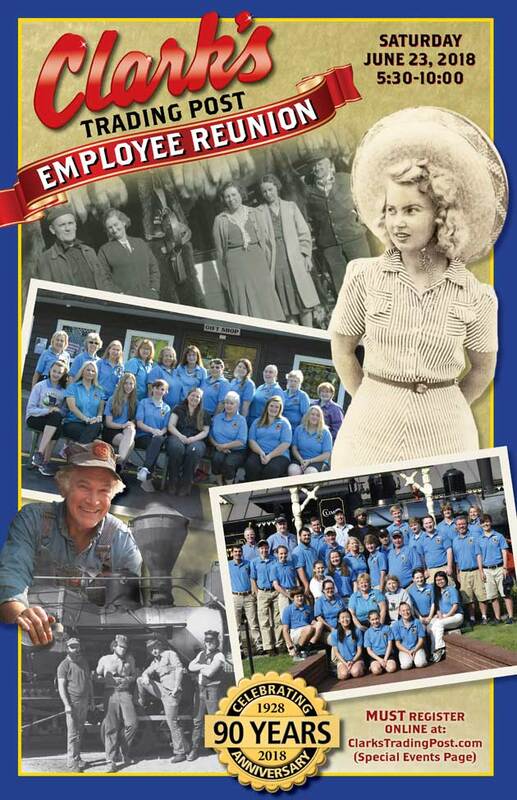 Reminisce with your fellow employees about the good ol' days working at Clark's Trading Post and the White Mountain Central RR. You and a guest are invited to enjoy all the fun that includes, music by the Wicked Smart Horn Band, a circus act, train rides, food and fireworks. CHECK IN: Check in will be from 5:30 to 6:30 at the railroad station. At this time you will receive a packet with your food & ice cream sundae vouchers, name tag and schedule. WELCOME & CIRCUS ACT: Murray Clark will give a welcome at 7:00 at the performance ring followed by the Yandong Chinese Circus Act featuring Arevik Seyranyan. TRAIN RIDES: There will be two train rides at 6:30 & 8:00. Both rides will be chased by multiple Wolfmen from throughout the decades. Who was your favorite?? MUSIC: Music will be provided throughout the night by the Wicked Smart Horne Band who play energetic, soulful music with a mix of rhythm and blues, swing and rock. Bring your dancing shoes! FOOD: There will be a limited menu available at the Whistle Stop Snack Bar and Pullman's lunch. There will be burgers, dogs, pizza and salads available. Dessert will be a make your own sundae at the Peppermint Saloon with Gifford's hard ice cream or choose soft serve from the Whistle Stop and add your own toppings. SHOPS: The Candle Shop and the You Name It Emporium will be open for you to check out the latest items for sale. Our new Arcadia Press book about the first 90 years of Clark's Trading Post and the White Mountain Central RR will be on sale that night for $22. You will be among the first to be able to purchase one! MUSEUMS: All five museum buildings will be open for the reunion. RIDES & ATTRACTIONS: All other rides and attractions will be closed for the employee reunion. FIREWORKS: The fireworks display will begin at 9:30 in the main parking lot. MORE INFORMATION: For more information contact Anne Englert at 603-745-8913 Ext. 19.